The craze for getting through a govt job in rising among engineering graduates. Eligible BTech / BE graduates are more inclined to govt jobs these days. Likewise vacancies are also opening up for engineering specific disciplines. Here’s a complete list of all active jobs open for recruitment in leading PSUs and other govt bodies. Engineering graduates are therefore suggested to go through the detailed advertisement of each and apply before the last date of submission. Applications, are primarily, accepted online. Therefore candidates should be well versed with the online application process and must be ready with a valid email address, scanned copies of all documents along with photograph and signature. Majority of the vacancies have been announced by NBCC (103 posts). Engineering and finance graduates can apply to these posts. Vacancies have been announced by ISRO, BEL, RITES and other organizations for recruitment to the post of Software Engineer, Junior Engineer, Junior Engineer Assistants and even for managerial posts. Those interested to join defence sectors, can also apply at Mazagon Dock. 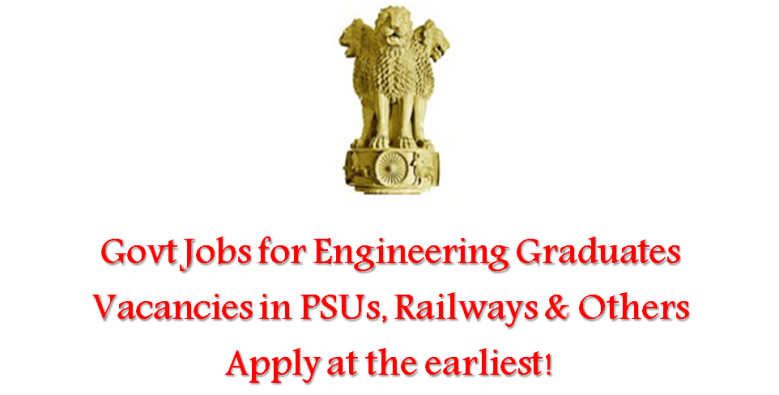 Similarly railway jobs (Konkan Railway Corporation Ltd) are also open for engineering graduates.